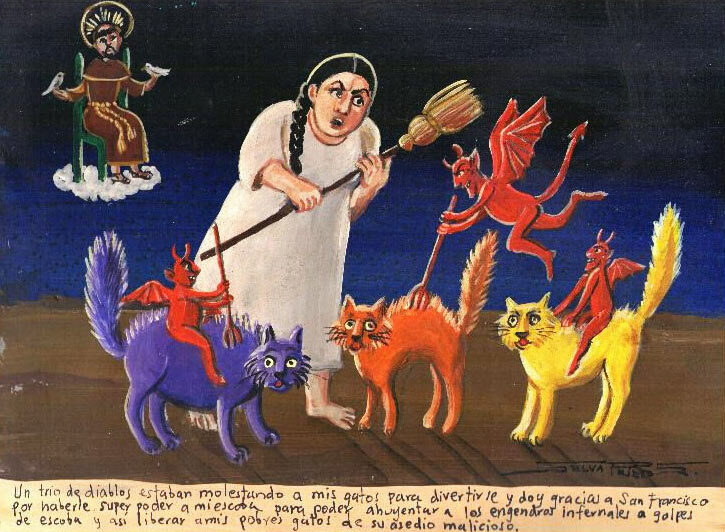 Eusebia Maldonado was sick with fever, and many little red devils came to her. They climbed to Eusebia’s bed and pricked her with their tridents. She though she was going to die and the devils came to take her to hell. 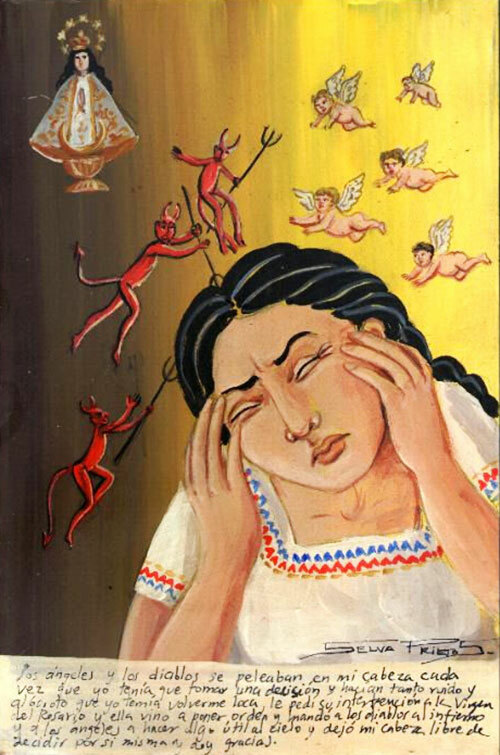 Although she had sinned, she didn’t think she’d sinned so much to suffer this harassment from the devils. 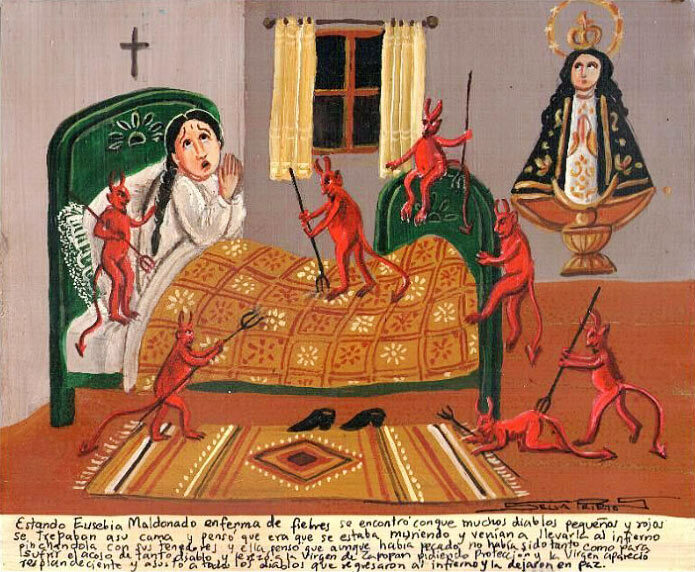 She prayed the Virgin of Zapopan for protection, and the Virgin appeared in her splendor and scared the devils away. They left Eusebia in peace and ran back to hell. A terrible devil rode around. He brought devastation and destruction. 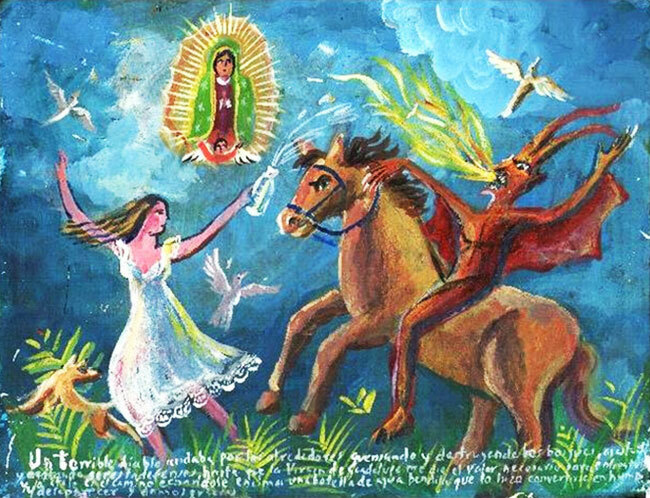 He put the forests on fire, killed poor creatures, until one day the Virgin of Guadalupe gave me enough courage to face the devil. I stayed on his way and poured the whole bottle with holy water on him. The devil became a smoke and evaporated. We thank the Holy Virgin for delivering us from the devil. 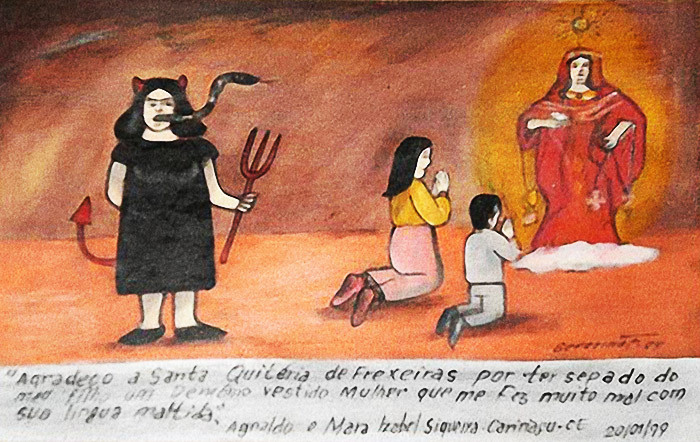 I thank Saint Quiteria of Frexeiras for chasing away a devil in woman disguise from my son. Her damned tongue caused me a lot of troubles. 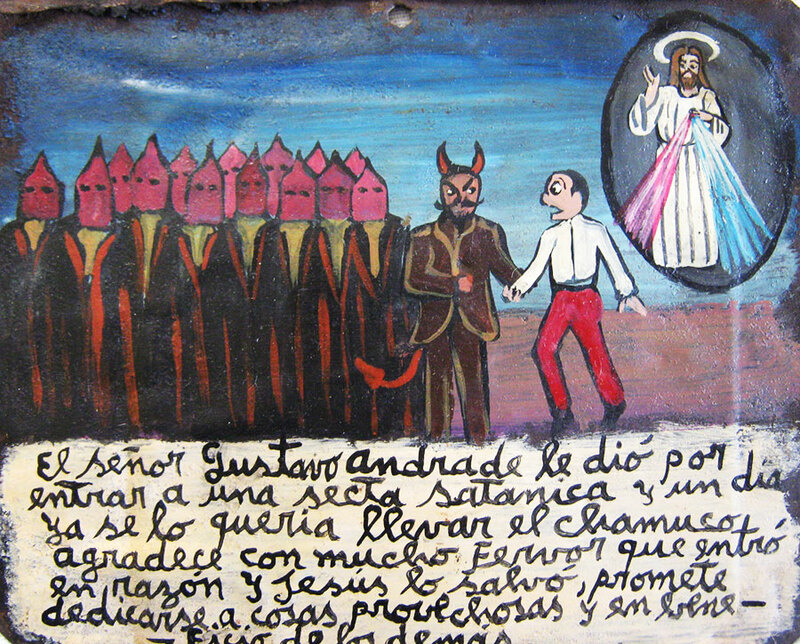 El Zapo dedicates this retablo to the Virgin of San Juan. 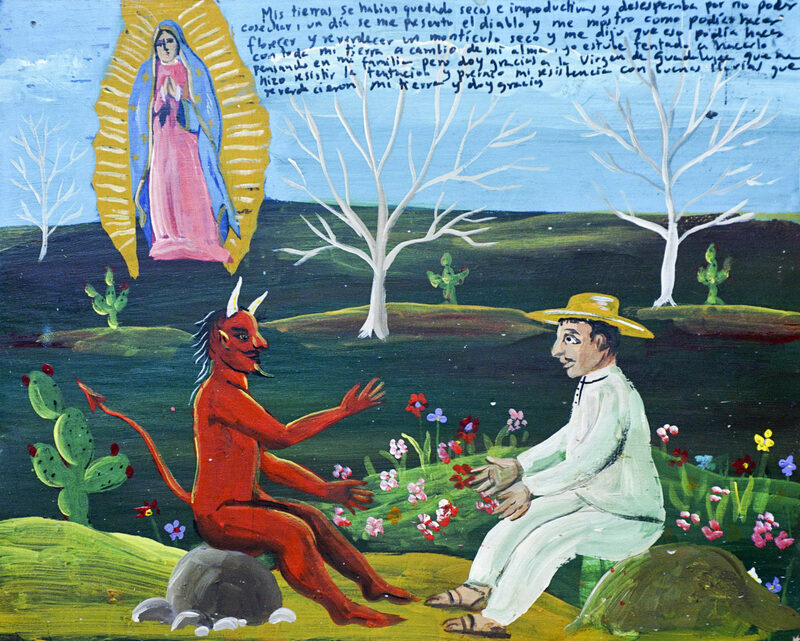 He was taking drugs with el Pillo when the devil appeared to them and frightened them a lot. He implored the Virgin so nothing bad would happen to him. They promise to not take drugs anymore and ask the Virgin to not leave them alone since they are many like us at the streets. Gustavo Andrade joined a satanic sect. One day the devil wanted to take Gustavo with him. Gustavo thanks because he came to his senses and Jesus saved him. He promises to dedicate himself to good things and charity. We went to visit our friends. My buddy and I drank tequila while our wives were gossiping about the people in the village. 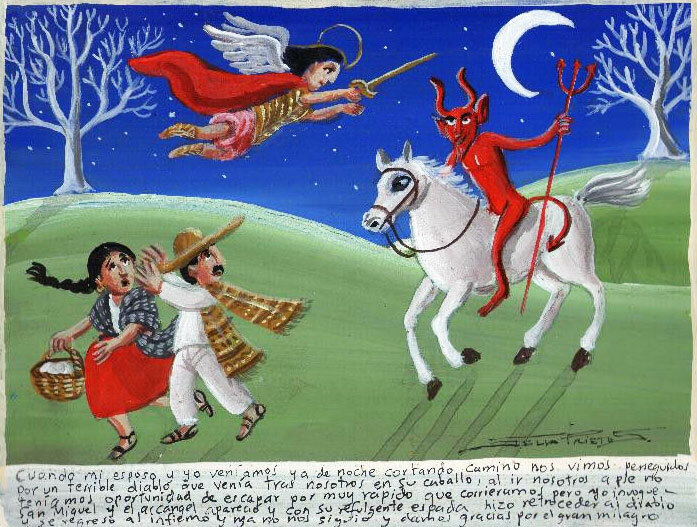 We were coming back late and saw the devil chasing us, of course because we had been bad. In fear we implored Saint Michale the Archangel, and he came to save us from the demon because he knew we weren’t bad people but just that night. 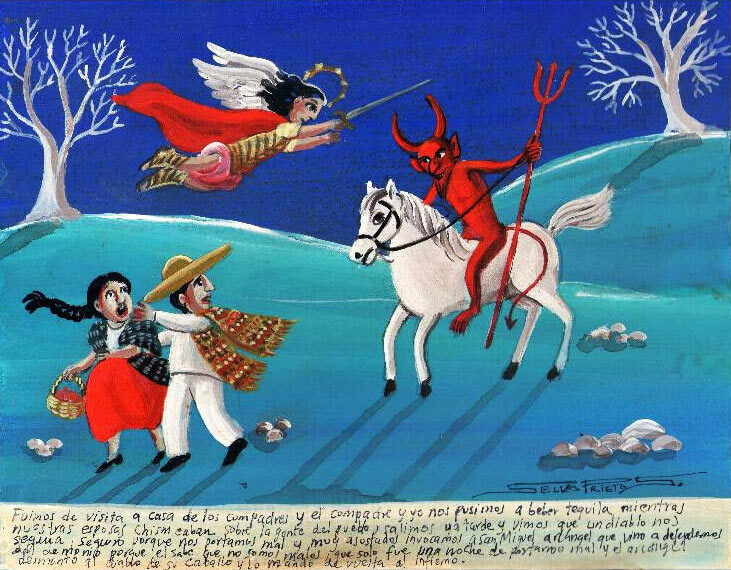 The Archangel scared the devil and his horse away and sent them back to hell. My land became dry and infertile. I was in despair for not be able to harvest. One day the devil presented before myself and showed me how he can make a dry mound became green and flourishing. He said he could make it with all my lands in exchange for my soul. I was thinking about my family, and it was very tempting. But I thank the Virgin of Guadalupe for I could resist the temptation. My resistance prevailed with the good rains coming to my land and making it green again. I give thanks. It was late when we left the wedding celebration of our cousin Filemon. We were riding back home, and the devil himself appeared to us. He blocked our way and wanted to take us with him. 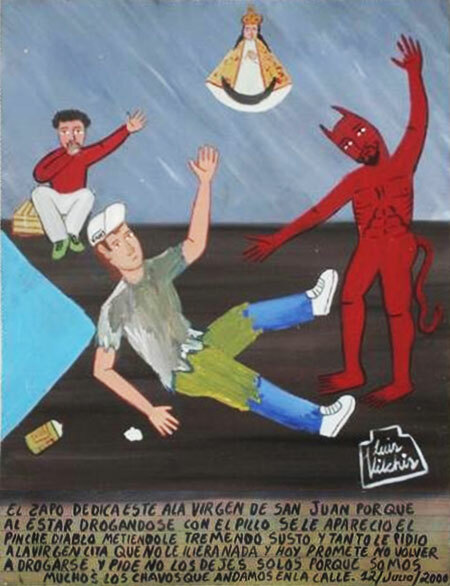 But since my brother and I always wear the Virgin of San Juan’s medallions, we showed them to the devil, and he didn’t dare to come closer. He vanished with a smoke leaving the sulphur stink. We thank the Virgin for protecting us. The devils and the angels were fighting in my head every time I had to make a decision. They were making such noise and racket that I was afraid to go insane. I asked the Virgin of the Rosary for her intervention, and she came to establish order. She sent the devils back to the hell and the angels to do something useful at the heaven. They left my head, so I could decide on my own. Thanks. 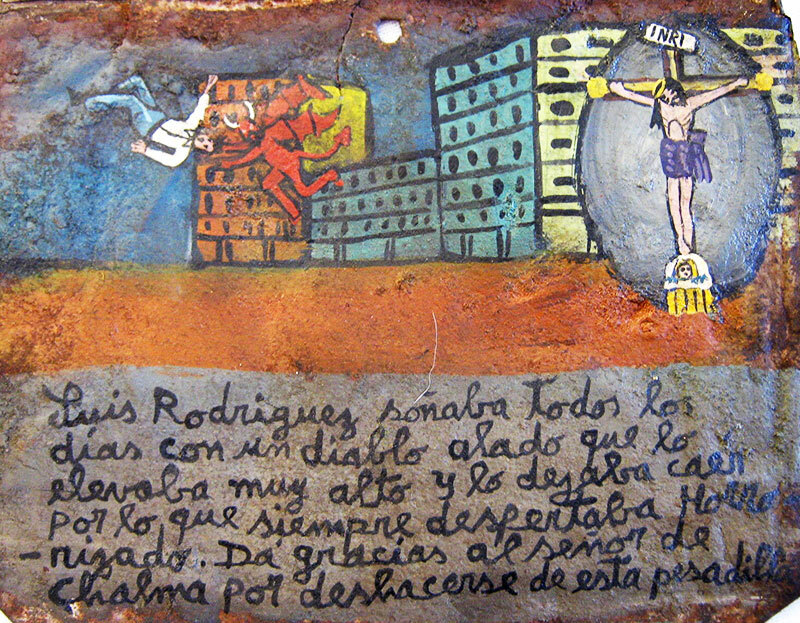 Every night Luis Rodrigues had a dream about a devil who was taking him up very high and then let him fall him down. Luis woke up very frightened. He thanks the Lord of Chalma for delivering him from this nightmare. My husband and I were coming back home late at night and cut our way. 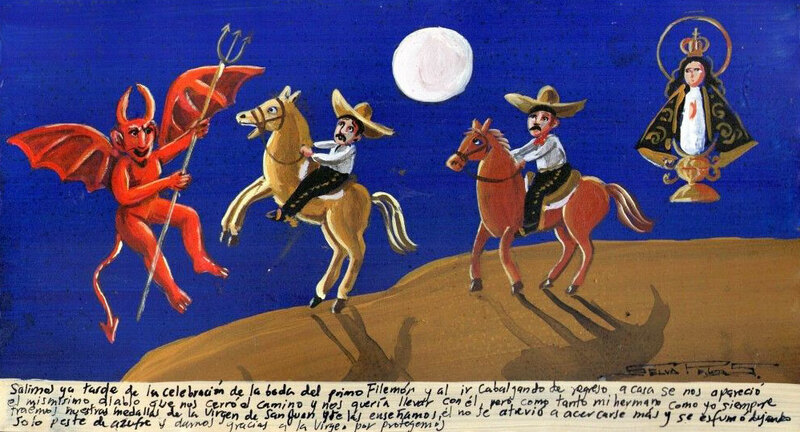 Then we saw a devil chasing us on his horse. We had no chance to escape no matter how fast we ran. Then I implored Saint Michael the Archangel. He appeared with his shining sword and made the devil back up. The devil stopped chasing us and returned to the hell. We thank for this great miracle. 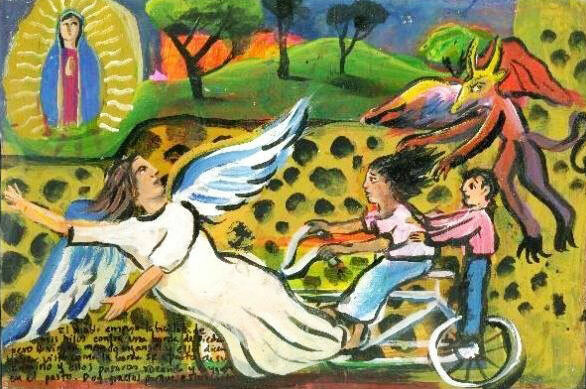 The devil pushed my kids’ bicycle in a stonewall, but the Virgin sent an angel. My kids tell that they saw the wall disappeared from their way and they went to the pasture. I give thanks.